Business hours: 5.00pm to 1.00am. AS I sit at the bar with my half pint of Kilkenny, the familiar refrain Where Everybody Knows Your Name from 1980s sitcom Cheers comes to mind. And I know why. Anyone who watched TV in the 1980s will know what I am talking about, about the cosy little Boston bar called Cheers where people meet to drink, relax, chat and have fun. Wouldn’t we all like to hang out at a place like that? Well, I’ve found my take-a-break-from-your-worries place and it is called Otheroom. The funny thing is I did not actually get around to visiting the wine bar until recently. Maybe it is because of its location or the fact that it is a wine bar that made it appear a little out of reach to me, or maybe I was just too lazy to climb the stairs. Whatever my excuse was, I am glad I finally took the time to go, seeing how the bar is in my neighbourhood and ideal for an after-work beer to de-stress. Its owners have done their best to maximise available space and have managed to fit in a central bar, walk-in wine cellar, as well as indoor and outdoor seating. White wicker chairs with tables for indoor seating, plush sofas and cushions in a cosy private nook and barrel-inspired tables and high stools on the balcony can accommodate up to 100 people at one go. 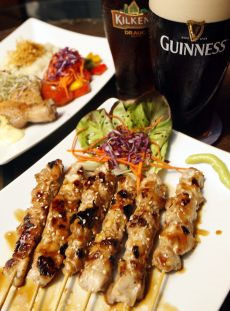 Stress relievers:Savour Dijon chicken and chicken yakitori(right) while having a pint of Kilkenny or Guinness. The open-air balcony may be a little narrow for some, but sitting here gives you the best vantage point, especially, if like me, you like checking out the goings-on in the street below. While I savoured the last dregs of my Kilkenny, co-owner Goh Kai Jian popped by and asked if I would like another drink or something to eat. This is the kind of attention you’d get at the Otheroom. While we chatted, I learned that 27-year-old Goh, who runs the bar with his two partners, is an engineer by day. 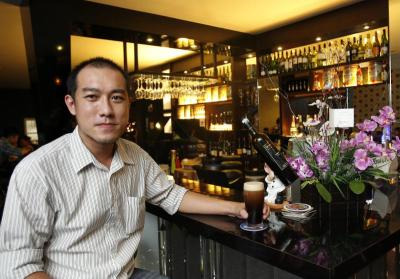 Seremban-born Goh is based in Petaling Jaya but puts in double duty and helps out at the bar at night. “Seremban folk who works in Petaling Jaya and Kuala Lumpur often frequent pubs and bars there for a drink after work. “And I thought, why not create a space where they can chill out right here in Seremban,” he said. From the get go, Goh and his partners knew what they wanted. “Not just any old pub but a classy place to have a drink and relax, that’s what we wanted. “That’s why Otheroom is really a wine bar. We wanted our wines to be the focus,” said Goh. 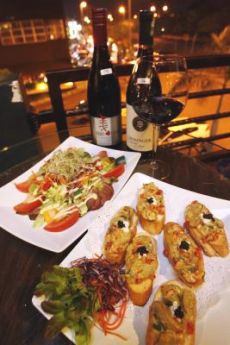 Delectable combo: Guests can sample a wide range of both New and Old World wines while nibbling on tasty appetisers such as fresh garden salad and mushroom bruschetta (right). If you are a wine connoisseur, the bar stocks New and Old World wines from Australia, New Zealand, Chile, Italy, Germany and France. Besides wine, the bar also carries beer and other liquor such as tequila, vodka and gin, and lists the usual cocktails. For me of course, the kicker has to be its fresh-from-the-tap draft beers and stouts. You can get Tiger, Kilkenny and Guinness here. Otheroom is also one of the few places in Seremban where you can enjoy Strongbow Cider. Goh is the first to admit the drinks are slightly pricey here but he insists that stocks are fresh, and coupled with the environment at the bar, well worth your ringgit. “You are not going to get stale beer here. If it is not good enough for us to drink, we throw it out. “I believe the prices are justifiable especially considering the environment we’re trying to create over here,” he said. As a woman, I know I feel safe enough drinking at the bar here alone without fear of inviting unwanted attention. Customers will be happy to note that there are no raucous crowds here and no live bands with screeching vocalists. This is a place where you can have a conversation without having to scream above the din. Food-wise, Goh and his team have hired a chef to whip up snacks and meals for hungry patrons. “When we opened in April, we really didn’t have anything but nachos and sausages. “But, now that we got a proper chef, we are slowly adding to our menu,” said Goh. On the menu now, are appetisers that include mushroom bruschetta, fresh garden salad, rosemary wings and bacon wrapped asparagus. For something a little heartier, there are pasta Alfredo, fish with butter sauce, dijon chicken and steak. Sadly, there are no desserts yet, but Goh promises me that I can expect to see sweet treats on the menu soon. Honestly, the Otheroom surprised me. For small town Seremban, this is really a nice place with the right combination of sophistication and homeliness. I was even more surprised when my brother informed me recently that his KL-based German colleagues have made the trip just to check the place out. Apparently, they agree that Otheroom warrants a return visit. Really? Well, you don’t have to convince me, I’m sold. Sometimes you just want to go where everybody knows your name.